First, you need to create an account and sign in. Then you’ll see new buttons in each author’s profile area for Follow. When you follow an author, the button changes to "Following". Simply click the button again to Unfollow if you change your mind about who you want to follow at any time. But you'll want to be sure to keep following our friend Jewel. Click to Follow an Author. 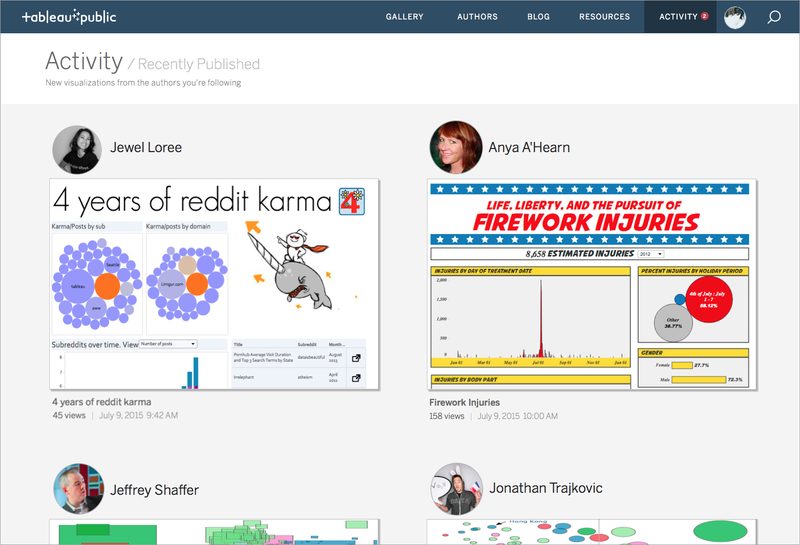 Then, each time an author you’re following publishes something new, you’ll be notified in your Activity view. How does this work with hidden workbooks, you ask? The simple rule is this: if you publish a workbook with the default setting ’set my vizzes to hidden' checked, the workbook will not show up in anyone’s Activity view. Don’t know who to follow? Check out some of our featured authors. There’s a few other new features here too: within each author’s profile (including yours), there are new tabs for Followed and Following. So if there’s an author you like, you can see which authors they follow, too. And, you can see who has decided to follow YOU. Ooh, that's not creepy. Find Out Who to Follow. I raised this idea via the Tableau community forum (http://community.tableau.com/ideas/4706), it's a great demonstration of Tableau listening and responding to end users.